Narrated Amr bin Al-As: I came to the Prophet SAW and said, “Who is the most beloved person to you?” He said, “Aisha.” I asked, “Among the men?” He said, “Her father.” I said, “Who then?” He said, “Then Umar bin Al-Khattab.” He then named other men [Bukhari]. Out of the wives of the Prophet Muhammad SAW, two have received prominence above the others. The first was Khadija, and the second was Aisha. Aisha was the favorite daughter of one of the Prophet’s favorite companions, Abu Bakr, and was the most beloved wife of the Prophet SAW after Khadijah. Sawdah, the Prophet’s SAW the second wife, and Aisha entered the life of the Prophet’s SAW household after the death of Khadijah. If we recall, the Messenger of Allah SAW never had another wife for over two decades during the time he was married to Khadijah. He was deeply grieved by her death, and it is acknowledged that he still felt sorrow at her passing years later. Those around the Prophet SAW understood the sadness that he faced, not just for the loss of his lifetime companion, but also for the other turbulent events that happened in what we now call the Year of Sadness. While many were concerned and offered their support in their own individual ways, Khawlah bint Hakeem was the one who took the initiative and broached the subject of marriage with the Prophet SAW. Khawlah was the wife of `Uthmaan ibn Math`oon, both of them being among the first persons to embrace Islam. It was Khawlah who originally suggested that Abu Bakr should offer his daughter Aisha for marriage to the Prophet SAW. For the sake of completeness, it is worth mentioning that it was also Khawlah who initiated the marriage of Sawdah to the Prophet SAW, however, we shall not be covering this aspect in this article. The suggestion to marry Aisha, while well received, proved to be diplomatically delicate for Abu Bakr, for the six-year-old Aisha was already engaged to a non-Muslim, Jubayr ibn Mut’im. It would have been socially unacceptable for Abu Bakr to have broken the engagement. However, with the will of Allah, the engagement was repudiated by the potential groom’s family on account of their disbelief in Islam, enabling Aisha to be engaged to the Prophet SAW. We pause at this juncture to deal with a sensitive topic, which is the age of Aisha during a marriage. Of late, this has created unnecessary controversy. However, if we look at the historical accounts of the social structure of the time, Aisha was already engaged to another man prior to her marriage to the Prophet SAW, indicating that it was socially acceptable for marital alliances between families to be forged at an early age. Also, women during that time reached maturity relatively quickly – psychologically, emotionally and physically – due to their upbringing and surroundings. In the case of Aisha, she attained intellectual, physical and emotional maturity exceptionally fast compared to her peers. If allegations were made against the Prophet SAW in respect of abuse or impropriety during the marriage, then one would expect all these claims to surface after his death when Aisha was free to speak without fear of repercussion from the Prophet SAW. Yet, even after his death, there is not a single recorded account of any complaint or statement about their marriage, save that the Prophet SAW was the best of husbands and that the marriage was an extremely happy and harmonious one. In today’s society, very few, if any, women would describe their husbands in such unequivocal terms. Aisha was nineteen when the Prophet SAW passed away, and until her own death over forty-five years later, she spoke of him lovingly. The aspersion cast upon the marriage by the modern media is totally unsubstantiated, as there is not a single recorded statement to support any of these those claims. The Messenger of Allah SAW later told Aisha, “You have been shown to me in (my) dreams on three nights. An angel was carrying you in a silken cloth and said to me, `This is your wife.’ And when I uncovered it; behold, it was you. I then said: `If this dream is from Allah, He will cause it to come true. '” [Bukhari and Muslim]. Thus, this was a marriage between two exceptional people – the last of the Prophets who was nearing the end of his life, and a woman still at the beginning of hers. Aisha was a very intelligent and observant young girl with an extremely sharp memory. Due to her proximity with the Prophet Muhammad SAW, she was able to recount and educate the ummah on intimate details regarding marital relationships, personal grooming, medical prescriptions and behavior within the household. Aisha spent approximately nine or ten years of her life with the Prophet SAW. Her greatest asset was not her youth or beauty, but her piety, extraordinary generosity, ability to record the sayings and behavior of the Prophet SAW, her accurate memory, and her intimate knowledge of the Qur’an. She absorbed knowledge like a sponge and this ability made her the educator and transmitter of the sacred knowledge to men and woman. A great deal of the knowledge that we still have today, about how our beloved Prophet SAW lived and behaved, was first remembered and then taught to others by Aisha. As the prophetic guidance continued to be revealed through Prophet Muhammad SAW during the years of their marriage, Aisha’s way of life – along with that of all the Muslims – was gradually reshaped and refined. It was during this time that Islamic jurisprudence was established and when the rites of worship in Islam were finalized and clarified. In other words, it was during their marriage that the teachings of the religion of Islam were perfected. Aisha was once asked to describe the Prophet SAW, and she replied that he was ‘the Qur’an walking’, meaning that his behavior was the Qur’an translated into action. She did all that she could to do likewise. Thus she not only knew and embodied the Sunnah, but also she memorized the Qur’an by heart, understood it and lived it. Such knowledge was eventually compiled in various Islamic literature, providing an encyclopedia for generations to come, supporting the Muslims and even the Caliphs of the later generations. It was during the course of their marriage that, amongst others, the battles of Badr, and Uhud, and Al-Khandaq (the Ditch) were fought. These were the three major battles against the Quraish, that shifted the balance of power out of the hands of the disbelievers and into the hands of the Muslims. Although she was still very young, Aisha participated in them all, bringing water for the Muslims warriors, and helping to look after the wounded. She witnessed life, and she witnessed death – both in the way of Allah and in the way of the disbelievers – and she understood both. Indeed one of the meanings of her name, Aisha, is ‘life’. Aisha’s knowledge was like a beacon that illuminated the hearts and minds of Muslims for generations to come. This is not surprising, for she is one of the four people who has transmitted more than two thousand hadiths, the others being Abu Huraira, Abdullah ibn Umar, and Anas ibn Malik RA. Al-Haakim said in his book, Al-Mustadrak. “One-fourth of the rule of Sharee`ah was narrated on the authority of Aisha.” Umar Ibn Al Khattab, during his own Caliphate, said that without Aisha, he would be lost and destroyed, in every small and big issue, he used to ask her for advice and consultation. How many Muslim men today seek consultation from a woman if she has more piety and knowledge than them? How many Muslim men today respect their wives, spouses, or daughters or anyone in society for their knowledge and caliber, regardless of their gender? How many Muslim women today are authorities on religious knowledge and texts? Surely those who fabricate the lie are a group from among you. Do not think it is a bad thing for you; no it is good for you. Every man will receive what he has earned for this sin, and whoever had the greater part in it will have a great punishment. Why did the men and women believers, when they heard it, not think good in their selves and say: ‘This is clearly a lie?’ Why did they not produce four witnesses? Since they did not produce witnesses, they are certainly liars in the sight of Allah. If it were not for the grace of Allah, and His mercy on you in this world and in the next world, an awful doom would have overtaken you for what you repeated. Since you received it with your tongues and repeated what you did not know anything about with your mouths, you thought it was a trifle, but in the sight of Allah, it is serious. Why, when you heard it, did you not say: ‘It is not for us to repeat this, Glory be to You (O Allah), this is a serious rumor.’ Allah warns you to never repeat anything like this again, if you are indeed believers and Allah makes the signs clear to you; and Allah is Knowing, Wise. Surely those who love to spread around slander about those who believe will have a painful punishment in this world and in the next world; Allah knows and you do not know. (Qur’an 24:11-19). The fact that Aisha’s honor and reputation had been protected by a revelation from Allah could not be ignored by anyone, and from then on everyone was more aware of her high station with Allah. Aisha endured poverty and hunger with the Prophet SAW. It is authentically related that months went by without the fire in the hearth is lit, i.e. without any food being cooked, during which time they simply survived on dates and water. Her reply was: “Indeed I desire God and His Messenger and the abode of the Hereafter,” and her response was followed by all the other wives. She developed the nickname the Mother of Fragrance, for every time a beggar knocked on her door, she would touch the money with perfume before giving it to him. When asked why, she explained that the charity would reach Allah before it reached the beggar’s hands, and she wanted the charity to be given to Allah in a fragrant condition. She rationalized – how many atoms are there in a grape? How many of us are of such a status, where our vigilance, thinking and even the smallest action is completed for the pleasing of Allah and reflected by the Qur’an and teaching of the Prophet SAW. While the Prophet SAW was fair in the treatment of his wives and loved all of them, Allah is the owner of the hearts, and the Prophet’s SAW heart was inclined towards loving Aisha the most. There are many accounts which indicate that Aisha was the favorite wife of the Prophet SAW after Khadija. The Companions noticed this and reserved their presents to the Prophet SAW when it was his turn with her. Naturally, this inspired some jealousy amongst the other wives, however, Aisha was gracious and never belittled them, nor did she view them as her rivals. The only wife that she was truly jealous of was Khadija, the Prophet SAW’s first wife, who had passed away before she was married to him. The room in which he died is the only room of his wives which is preserved up to today. Two years later, his Companion, Abu Bakr, Aisha’s father, was buried beside him. Later, as Umar Al Khattab was in his death throes, he appealed to Aisha to be buried next to Muhammad SAW. Aisha had actually reserved that space for herself, for she wished to be buried next to her husband. However, the love that the Prophet SAW bore for Umar caused her to honor Umar by sacrificing her beloved burial ground for him. Such was her generosity and nobility. After the death of Prophet Muhammad SAW, Aisha was readily involved in continuing his messages. She was present through the reigns of at least the first four Caliphs. She continued a commitment to the memory of her husband and her firm belief about being reunited with him in Paradise. She then surrendered her soul in the night of 17th of Ramadhan at the age of sixty-six. Aisha’s life after the death of the Prophet SAW is evidence against all the stereotypes of how Islam treats women and accusations of how women in Islam have no status. We can read the detail of all the stories of Aisha and realize the wisdom of Allah and His Messenger, to have, for over forty years after the death of the Prophet SAW, the highest and most authentic level of knowledge from Aisha. Look at the ultimate wisdom of Allah. Abu Bakr sacrificed his entire life in the path of Allah, and Allah granted him a beautiful gift which was to let his daughter be the most beloved wife of Rasulullah SAW after Khadija, and decorate his daughter Aisha with the charm, intelligence, integrity and memory, and make her the library of knowledge and source of wisdom for many generations to come. She carried the in-depth legacy and knowledge of Rasulullah’s SAW memory. One cannot open Islamic books about the Qur’an, the biography of Muhammad SAW or jurisprudence, without finding Aisha’s name referenced in there. What a great honor for such a woman. 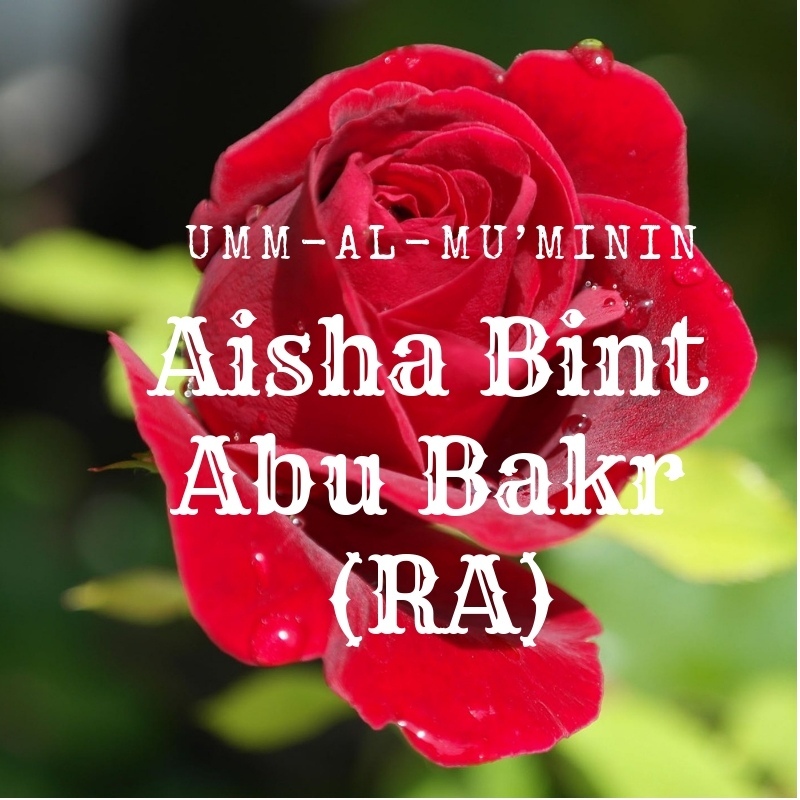 Aisha, Umm-Al-Mu’minin, even though she never had a single child, yet she is the Mother of Believers.